Well, what's the Halo equivalent to the Eta-2 Jedi Starfighter? Banshee. Though their already in the rp. Both Railfire and his direct troops have that alt. I guess Railfire's his ride to Vector Sigma once Firestorm finds that maintenance duct, if one exists. There isn't one, and I'm just waiting for anyone to try to tunnel in. I don't mean from a power scale standpoint, I mean from a canonical standpoint. I think we should mix as little continuites as possible. We have Halo alt modes but, you are Acting GM; what you say goes. I just thought it would be a good fit for Firestorm. And that's all they are. Just alts. There's no story significance to it outside of that. Yup, I just thought an Eta-2 or two would be a nice bit of variety considering that by now Cybertronians have probably interacted with a fairly decent number of different cultures and technologies. They actually haven't. Space travel hasn't been developed quite yet. Firestorm ' s a head. Besides, it might be better to think of a virtual redeco of an existing TR figure. Trigger Happy would work well. Technically, I actually do have the Mace Windu-Jedi Starfighter TF Crossovers figure in my possession IRL; would that count if I posted a picture of it in both modes? Also, who is Trigger Happy? Is he the Skylanders character? 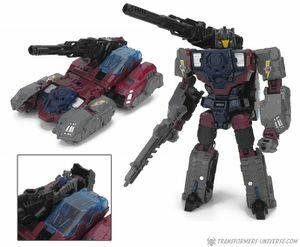 He is a Titans return figure. Transformers Crossovers is not true to transformers lore in the sense that it's the Star wars characters piloting mechs. No, I'm talking about the TF character. He got a really good toy in Titans Return, which would work well as a body for Firestorm, with some digital color editing. do you want a transector or a character with a head? A Transtector that is a fast tank. 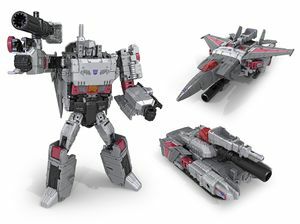 Dang it, I envisioned Dynamo as a Megatron retool. I like the Megatron-esque one's design.